Search engine optimization is not just a trend in digital marketing. It is a lot more than that. Failing to optimize your website’s content for the Search Engines often leads to a lower ranking in the SERP and thus, to a lower number of visitors. 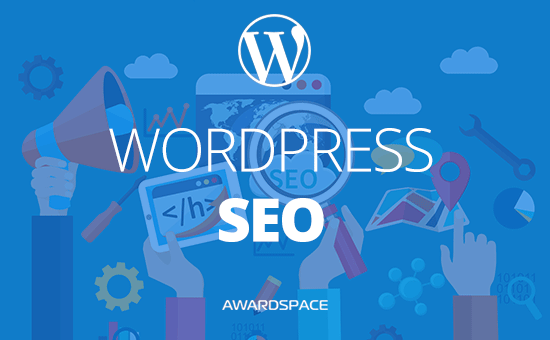 WordPress SEO, as everything in WordPress, is easier. Now that you’ve created a website with WordPress, and started publishing your posts it is time for you to start optimizing them so that the search engines will index your website sooner. Presuming that you know what SEO is, let’s start with this WordPress SEO tutorials right away. To SEO your WordPress website, you, most often than not, should use a plugin. But that part we’ll leave for the end of this tutorial. Meanwhile, let’s take a look at the top ranking factors that you can alter. Your WordPress website has to have a high loading speed. We already have a tutorial on how to speed up a WordPress Website. Except for the website optimization, one of the key factors of the speed of your website is the hosting service that you are using. Using WordPress Hosting is the best solution for every WordPress site. A related to the speed (but not only), and a very important ranking factor is the time that users stay on your website (i.e. bounce rate). If the users are landing on your website, and leave it right away, the search engines presume that the visitors didn’t find what they were looking for, and thus, your content is not relevant to the search query. To SEO a WordPress website, you need to optimize its speed, and the content. Furthermore, take care of the permalinks of your website, and for the SEO title, and the SEO meta description. We’ve covered the topic of what are permalinks in our WordPress Tutorial. In that same article, we’ve glanced the surface of how and why are the permalinks are important for the ranking of your website on the Search Engines. In this diagram, we’ve shown the difference between the main URL of a website, a slug, and a permalink. For more information, refer to our article on WordPress Permalinks. Anyway, the best way to utilize the power of SEO in your WordPress website doesn’t exist. If your website’s permalinks are non-readable to humans, meaning they are a random string of post type and an ID number, like “?p=123”, but your website still ranks in on the first page of the search engines, you might want to leave it as it is. Bear in mind that, if not done correctly, changing the structure of your permalinks might result in deterioration of your current ranking. But if you are starting a website, it would be better to change the structure of your permalinks to human-readable words. The permalink to the article you are currently reading is “awardspace.com/wordpress-tutorials/wordpress-seo/” which is a human-readable permalink structure. And, depending on how many content types you have on your website it could be the best. Not only your posts will be gathered together so that every Tutorial post is in the tutorial category but your website visitors will be able to orientate themselves at any time by looking the URL that they are currently on. In few words, the best permalink structure for SEO in WordPress (and not only), depends on how much content types your website has. If you have a blog, and nothing else, the best structure is “websitename.com/post-name”. Whatever structure you choose to use – one that shows the category name – or one that doesn’t, it is crucial for your post’s slugs to be composed of words. The blue text on the top is the so-called SEO Title, the green one is the link to which the searcher would be brought, whether he decides to click on your result in the SERP’s. The dark greyish text is the SEO meta description. Bear in mind that most of the webmasters are not customizing those, thus they are leaving the contents of the SEO title and description to the pure luck. In other words, these so-called SEO titles and descriptions will be automatically generated, if they are not customized. And while your competitors might miss on the opportunity to customize their search result page content, you might want to do just that, so you get most of the clicks in the results, and thus get ranked higher. Everyone who claims to be an SEO, and to have even a bit of expertise in the field, talks about the mythological ranking factors. And yes, they exist, and they are way too much for a single person to be able to pay attention to each one of these factors. But some of those factors you shouldn’t leave unattended. Like the click-through rate. The search engines are evaluating what percent of the people that have seen your page in the SERP, have chosen to click on it. The higher the CTR, the more relevant your content is to the search. Thus, the higher your rankings will be. To utilize the full potential of the SEO Title and SEO Meta Description, you should know that, they are not changing directly your rankings, but if written better than your competitor’s, and you get the most clicks, the SEO title and description could be a highly effective method to rank higher. These so-called SEO Title and Description, are the title and the description that the users of search engines will see when they look for something on the web. Thus, if you use the right words(and the keywords you want to rank for) in this SEO introduction to your content, you’ll collect most of the clicks. To install a plugin in WordPress is easy. It is a lot harder to choose the right plugin. There are a vast number of plugins, presenting a solution to each problem you might have. If you want an SEO plugin, there are a lot of them. Still, the best plugins WordPress SEO plugins are Yoast SEO and All in One SEO Pack. They are giving you the ability to create an XML sitemap, to edit the social media featured images, and, of course, to optimize the article you’ve written. 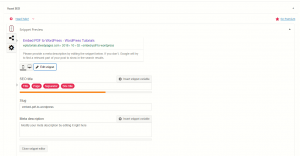 Both Yoast SEO, and All in One SEO Pack will let you change the meta title and the meta description of your post. We, at AwardSpace, have chosen Yoast to optimize our WordPress website for the search engine. In our WordPress Tutorials website, which we use to showcase what the CMS is capable of, we’ve chosen a post which we’ve used to show you how to embed a PDF in WordPress. Now that post will be once more of value, so we could show you how to add SEO Title and meta description. With both of the plugins, if you want to customize the meta title and description, so they serve your SEO purposes, you need to scroll down below the post(or page) editor, and to find the section dedicated to the plugin. With both of the plugins, you’ll be presented with the opportunity to change the targeted keyword, the title, and the description which are to be shown in the SERP’s. Here is how both of the plugins’ section look, and what to do, once you find them. The All in One SEO Pack plugin is giving you the ability to change the Description and the Title that are to be shown in the SERP right away. As with any other plugin or method you are using to customize your meta description and title, you need to choose attractive wording, relevant to the actual content on the page, and to use the keyword that you strive to rank for, as it will be bolded in the SERP, if it matches the search of the users. In Yoast, you’ll have to click on the “Edit Snippet” button to change the automatically generated texts that will be your presentation in the SERP. The button is located between the example graphic and the readability score and the keyword suitability evaluators. You need to click on that button, so the actual fields where you’ll write your chosen SEO Title and Description will show up. Once, you’ve clicked the Edit Snippet button; you’ll be presented with fields where you can write your SEO title and Description. There are more evaluators here. They are to guide on whether you are doing a good job, writing your SERP result.